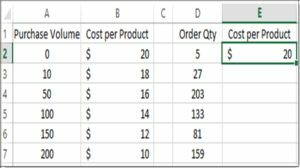 Excel’s VLOOKUP function is a very powerful tool that allows users to combine and match two columns in separate datasets. When performing a VLOOKUP, a given value is matched in a separate range of values within a specific column, returning a value (the desired lookup value) specified in the column index of the row of the match. The V in VLOOKUP stands for “Vertical” column. 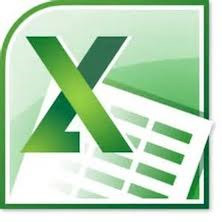 A good example of how the VLOOKUP function operates is looking up a number in a phone book, or scanning a menu to determine the price of a food item. First, you scan through the list of items to find the value (phone number or food item) you are looking for (top to bottom), then you move your finger to the right to find the associated value (phone number or price) of the item you were looking for. In this post, I will provide a detailed example of how the Excel VLOOKUP function operates, using the APPROXIMATE match criteria. 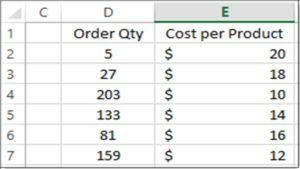 Now you want to determine the cost per product, based on different purchase order quantities. Here is where the VLOOKUP Approximate match comes into play. TRUE – This tells the formula to use an “APPROXIMATE Match” – searches for the value that is closest (approximate) to the lookup value. This is the default method if you don’t specify one. Note: If you want to get accurate results using the Approximate Match in a VLOOKUP formula, you must sort the lookup column in ascending order (whether the values are in text or numeric format). The reason for this is when Excel performs the Approximate Match, it is looking for the value in the lookup table (row) that is less than the value being looked up. At the same time, it will go one row further and if that value happens to be greater than the value being lookup up, it feels the previous values is the correct “Approximate” match and will return the column index of the matched row. Absolute Range: In argument #2 above, you will notice “$” signs around each cell reference. This creates an absolute cell range, which will not change as you copy the formula. to add an absolute range, highlight the original lookup range (i.e. highlight the characters “A1:B7”) in the formula editor and press the F4 key. 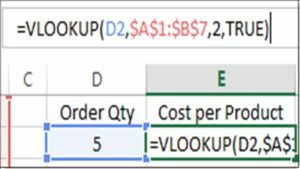 In cell E2, the result of the VLOOKUP is $20. 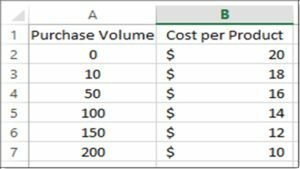 Since the Order Qty was 5 items, the formula scanned the Purchase Volume (Column A) in the lookup table (Table A), looking for the first value that is less than the value being looked up (Order Qty of 5 is being looked up). The approximate match returns the next largest value that is less than your specific lookup value, then returns the column index (in our example, the column index in the formula was “2”, so the formula returns the “Cost per Product” (Column B) in the lookup table (Table A).